In a previous post, I mentioned that I'd purchased some Sketch Pens for my Silhouette Cameo. Several commenters wanted to know more about them, so last weekend I set aside some time to test them out, aka, play around. First order of business...shopping! 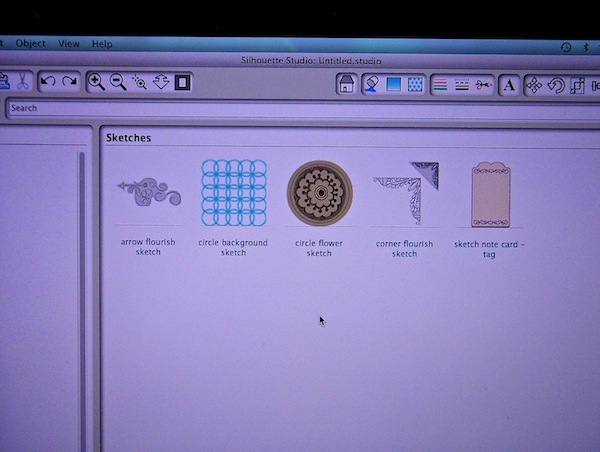 I purchased a few basic sketch shapes in the Silhouette Store: an arrow flourish, circle background, circle flower accent, corner flourish and sketch note card. 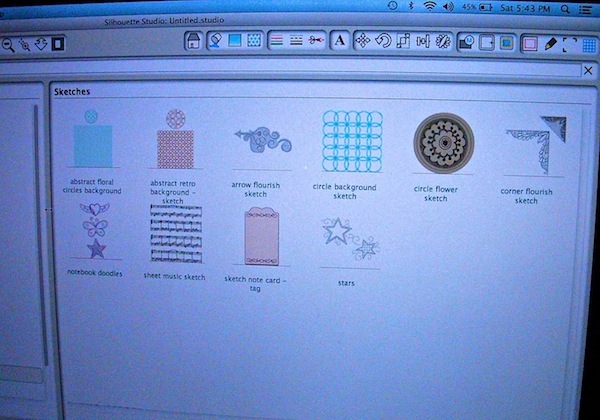 You can tell which shapes are sketch designs in the store by the little "S" in a square in the corner of the design description. 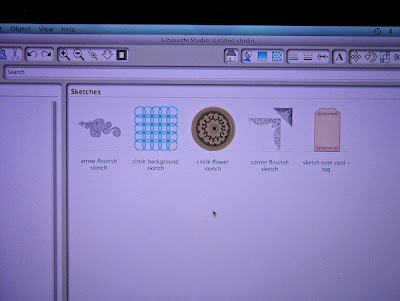 You can also search specifically for sketch designs. I decided to try out each color pen using a variety of the shapes. First, the black pen and the arrow flourish. Worked like a charm. The black sketches are very classy, in my opinion. The red pen and the purple pen with the circle flower also worked great. I changed the size of this sketch just to see what difference it would make. They both looked good to me. Re-sizing a sketch seems easier than re-sizing a cut because drawing smaller is not as big of an issue as cutting smaller. 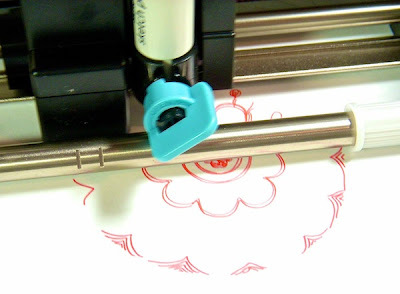 You don't risk tearing the paper with a smaller sketch. A few of the pens did not print super well at the very beginning. It's like they needed to get going, just like a regular ball point pen does sometimes. This was more of an issue with the lighter colors, like yellow and green, not so much the darker colors. I selected the Cut Again button to go over some of the sketches a second time, which worked well. Here's what I ended up with on my sample page. Still not happy with that larger green tag, but the green pen sketched the corner flourish much more successfully. You'll notice with the arrow and the corner flourish I drew some with a border and some without. That is just a matter of ungrouping the shape and deleting that outside edge. I imagine that outside border is to help with cutting out the sketch if that's what you want to do. I really liked the results, so of course I headed right back to the store for more shopping! I added an abstract floral circles background, an abstract retro background, a sheet music sketch and some stars and notebook doodles. As far as using the sketch pens on an actual project, I think I will start with some cards first. I'm not very good at fussy cutting, so sketching on the background is a technique that appeals to me. 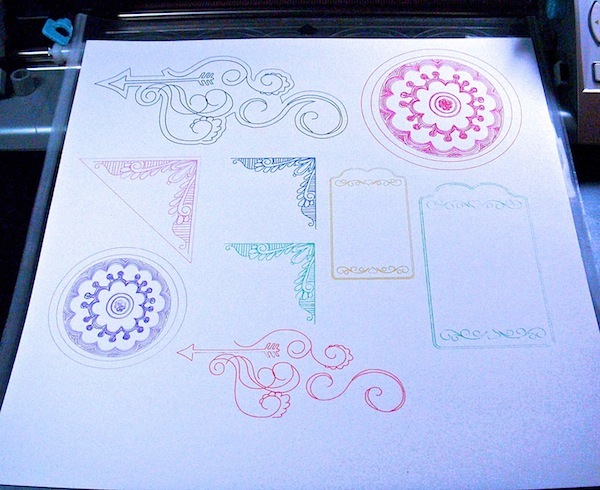 I did a quick search on Pinterest and added some sketch pen projects to my Silhouette Ideas board. 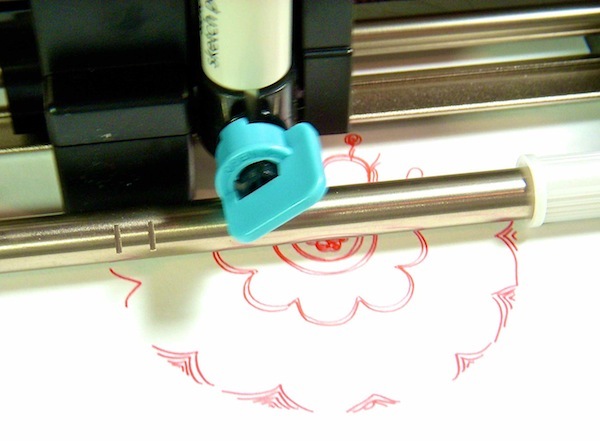 It is super easy to use the sketch pens. 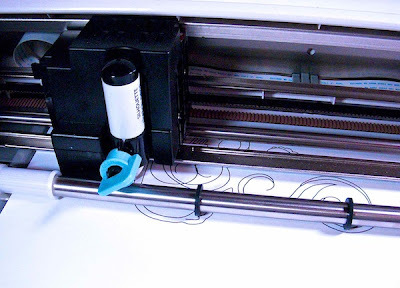 You simply replace the blade with the pen you want to use in your machine and select Sketch Pens in the Silhouette Cut Settings window. Here's a quick video if you're a visual learner like me. Ready to give the sketch pens a try? Or, what have you already done with yours? 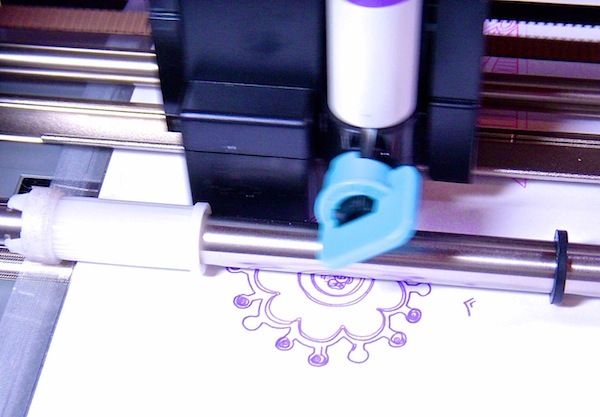 If you're not so good at fussy cutting, could you try using the blade with the outline once you'd drawn the sketch? This looks like so much fun! I'm getting sold more and more on buying a machine. Oh boy. LOL! Thanks for the review! You make me want to break out my sketch pen now! you know i have had a silhouette for over 7 years and i have never tried the sketch pens- looks fun! I've been interested to see the sketch pens in use, so thank you for sharing! I love the arrows with the flourishes around! Funny that you went back shopping - lol. Thanks for sharing your results. The designs look drawn by an artist and I guess they were but it is great that you can get that look at home and cut them out as well. I barely use my poor silhouette. Those pens look cool though. I have some of these on back order and can't wait to get them! Thanks for sharing your thoughts, Sue! Wow, that's pretty awesome. Thanks for sharing! 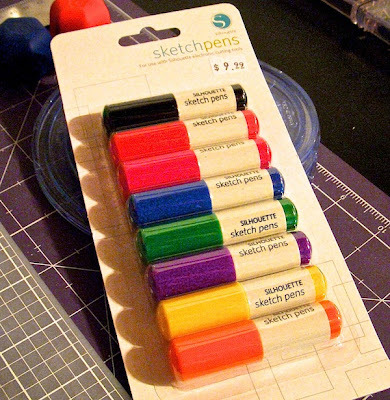 I wondered what you meant by sketch pens...this is really interesting. i don't have that machine...I have a confession...I own a cricut and have yet to turn it on myself! A friend has used it twice!!! thank you so very much for stopping by my blog and leaving me a comment! it really meant so much to me to read it!! this is a cool post! thank you for sharing!